Set nearly a hundred years in the future, Kelsa Phillips is devastated at the passing of her beloved father. Kelsa's mother seemed pretty cold about the whole thing, she must have either come to terms with his imminent death of her husband much earlier than Kelsa had, or maybe had been planning to divorce him, but didn't once his cancer was diagnosed. Kelsa resents the way her mother shunted her father off to a hospice as soon as she could. Shortly after the "official" sanctioned funeral, Kelsa holds her own ceremony, truer to what she thinks her father would have wanted, by burying his ashes in a park. That's when a boy who can transform into a raven appears to her, and tells her that she must quest with him to heal the earth's magical leys, damaged by pollution and bioterrorism. Of course, she disbelieves him at first, but after witnessing his impossible change from human to bird, she finally comes to accept that magic is real. Most of this book is a road-trip story, as Kelsa and Raven make their way through Oregon to Canada on their way to Alaska. There's plenty of Native American mythology employed as they are chased by several enemies of Raven, including Otter Woman and a dangerous group of bikers. Kelsa thinks Raven (in his human form) is quite handsome, even though she finds his shapeshifting off-putting. There's no time for romance though, as they struggle to make their way past security checkpoints on their journey. 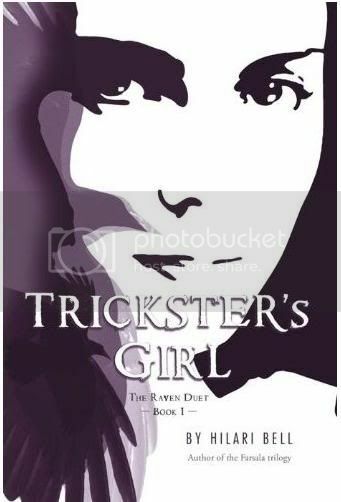 And Kelsa, having wisely googled Raven before she set out with him, knows that he's an unreliable trickster, albeit with his heart in the right place, something which makes her even more cautious around him. For a story set in the future, it didn't feel that futuristic to me. It could have easily been 5 years from now, not nearly 90 years. Think about how different the 1920's feel from today, and you might have an idea of what I mean. I felt like invoking 9/11 didn't make much sense either. Sure, there are some security concerns, and some bioterrorism, but I've seen other dystopian fiction take the idea of a police-state far, far further than this. As I've often mentioned before, I love a story about a young person gaining competency with their magical powers, but Kelsa's abilities seem quite subtle. Throughout most of the book, she follows Raven's directions as to when and where to perform the ceremonies that are supposed to cure the rainforests without feeling any tug of magic or special feeling herself. Bell's invented curses also fell a little short for me. When censors tried to erase certain four-letter words, Kelsa explains that people simply changed a few letters around, which certainly sounds very plausible. However, hearing "oh, carp" as the swear-word of choice just didn't seem to pack as much punch. I did really enjoy the sense of adventure, and the pace picked up significantly in the second half of the book. If cliffhanger endings drive you crazy though, you might do better to wait to pick this up until the second book of the duet is released. I was caught off-guard by the sudden change of gears at the end, and am curious how things will resolve. Now I can't wait for the next one! Holicrap, you have no idea how weird it was seeing you write a review with my name in it! I have to get my hands on this book now. If "Kelsa" has long dark brown hair, with green hazel-like eyes, I'm gonna flip out even more. Don't you mean "Holy carp"? LOL.